Can have extended life span. Large tree species in urban areas were often planted because they were pollution tolerant. They were pollarded (where the head of main branches are cut back to promote a more bushy growth of foliage) to prevent them outgrowing their allotted space, casting shade, obstructing electric wires and streetlights or blocking gutters. With cleaner air a wider range of smaller species are less expensive to maintain. There are situations where pollarding may still be appropriate. Adjacent to main roads for example, large trees may be required to provide a tall clear stem. Pollards are identified by the numerous branches, originating at the same point on the tree. These shoots have emerged from dormant buds under the bark or adventitiously from wound tissue. Initially the new branches are held weakly in place as they grow from under the bark rather than from within the tree. As the wood lays down annual rings the union strengthens often forming a thickened base where the shoot meets the trunk. Over a number of years a noticeably swollen ‘pollard head’ or ‘boll’ forms where new shoots spring up each year. Shoots growing from the pollard are removed while the wood is young close to the base of the new growth. The London plane, Platanus x hispanica, and common lime, Tilia x europaea are well known to be tolerant of pollarding. Other trees which respond to this treatment include some species of Acer, Alnus, Fraxinus, Liriodendron, Morus, Quercus, Ulmus. The best time for pollarding many trees is in late winter or early spring when food reserves are high and the tree is not under water stress. Avoid pruning Acer species in spring when they are prone to bleeding. Food reserves are depleted after the spring flush of growth but are replenished by summer. This can be a suitable time to pollard but avoid pruning in very dry weather when the tree will be under drought stress. Summer pruning may expose the roots and boll to strong sunlight. New growth may be poor as a result of this or from excessive shading from neighbouring trees. The least favourable time may be in the autumn when the wood is at its driest and can allow better access for decay fungi. The wood is also drier in frosty weather. Branches should be cut above the previous pollarding cuts, to avoid exposing older wood, which may be at an increased risk of decay. In some cases it is preferable to leave some living branches intact or to cut above a side branch. It is important to know what each tree will respond to. If this is not clear the advice of an arboriculturist should be sought. Neglected pollards could lead to large trees that can cause a nuisance. It may be desirable to bring trees back into regular pruning to restrict their size. It is best to consult an arboriculturist about what to do with a lapsed pollard tree. In some cases a tree can be cut back to the original pollard head. Platanus x hispanica (London plane) responds to this treatment, as it is less prone to decay when older wood is exposed. When trees such as Aesculus x hippocastanum (horse chestnut) which are prone to decay need to be brought back into pollard management they may be cut to a point higher in the tree to avoid exposing large amounts of older wood, creating a second set of pollard heads. In some cases, such as Carpinus betulus (hornbeam) or Fraxinus excelsior (ash) it is beneficial to retain some of the branches to maintain channels of active wood. Some oak trees such as Quercus robur and Quercus petraea do best with substantial portions of their main branches retained. Another option suited to some trees is to carry out crown reduction and thinning to reduce the weight of the crown instead of returning to a cycle of pollarding. 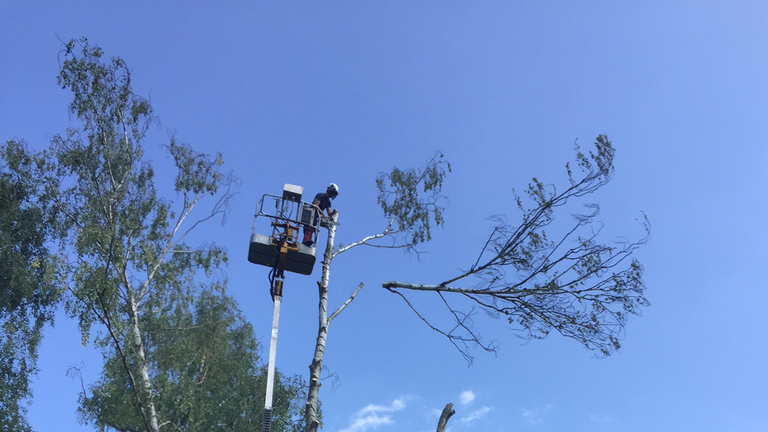 The tree can then be monitored for any further maintenance as it is required. 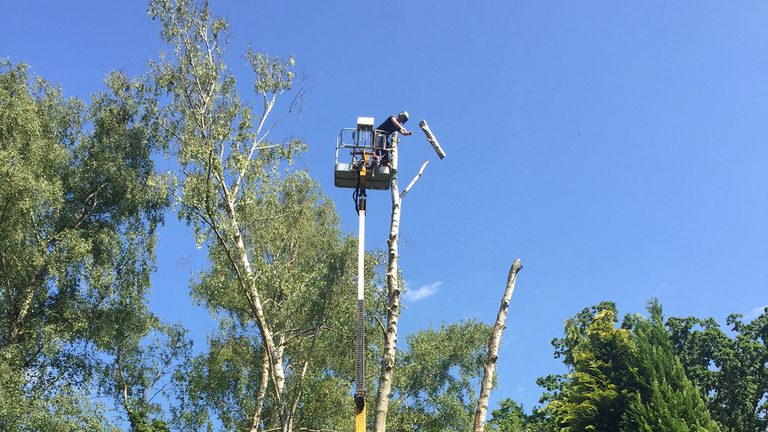 Trees with weaker wood prone to producing multiple shoots, such as Populus (poplar) and Salix (willow) can become hazardous and should be returned to a frequent cutting cycle. Trees such as Fagus sylvatica (beech), Quercus robur (oak) and Castanea sativa (sweet chestnut) are a problem mainly where branches become heavy when the pollard has lapsed for many decades.